While there are many techniques that can aid the muscles, one of the most beneficial is doing techniques in a pool. They aid better in health and give a better chance of avoiding injury. Water is a crucial ingredient for the internal and external benefits. Lean fitness programs also emphasize drinking lots of water because it helps with weight loss, reduces hunger and aids in flushing toxins out of the body so that skin is healthier and more radiant. The recommended intake for water is 8 glasses a day; however, if a person is more active, they should increase their intake of water. Using a pool to get fit is recommended for people who suffer from arthritis and even for pregnant mothers because it gives the body a buoyancy; thereby, eliminating the strain on the muscles and joints. 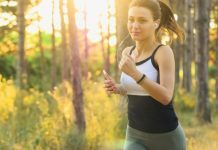 This is not to say you cannot get fit out of the pool, but this type of fitness simply eliminates a lot of the negatives that can occur when getting fit. Here are a few types of programs that emphasize water. Water yoga is doing yoga in the water. It gives the benefits of yoga; increasing flexibility, stamina, toning, strength and aids the cardiovascular system, while the water helps to prevent the odds of injuring the body. Water yoga has poses for flexibility, meditation and breathing. In order for the poses to be done properly, the water should be warm. 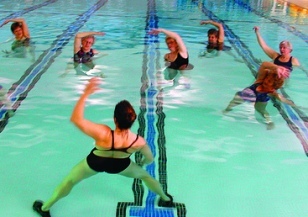 Another activity that can be done in the pool is aerobics. Stomach crunches can be done in the water by floating on the back and slowly bringing the legs toward the stomach. Other exercises include, jumping jacks, walking through the water and body stretching. Working with weights can also be done in the water. Triceps and biceps curls can benefit any water fitness routine. Stretching can also be done in the water by simply facing the side of the pool, holding onto the concrete side of the pool and placing the feet on the side of the pool, then slowly lengthening the body. However, make sure not to strain the muscles. Listen to the body and it will say how far to go. Water is important for a person’s everyday life. 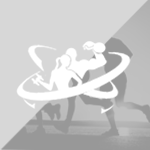 It helps the internal workings of the body and can be used in external fitness activities as well. Water fitness is also beneficial for individuals who are overweight, because it helps decrease strain on the joints. Swimming laps can also be an amazing form of exercise, so no matter what exercise is chosen, water fitness should be used in regular fitness activities.